Consider two intersecting (or overlapping) concave fields A and B that vary periodically, expanding and contracting, with equal or opposite phases. When A and B vary with opposite phases their different rhythms of variation can be considered two different temporal dimensions, T1 and T2. I assign T1 to A, placed in the left side of the central symmetry, and T2 to B, located in the right side of the central symmetry. We can distinguish two momentums or quanta in these periodical variation, M1 and M2. When AT1-M1 expands, BT2-M1 contracts; and later when AT1-M2 contracts, BT2-M2 expands. If these opposite phases of variation synchronize T1 and T2 will become a unique temporal dimension T. In this case AT-M1 and BT-M1 will contract and, later, AT-M2 and BT-M2 will expand. Notice that when A and B expand an contract periodically they create an inner kinetic energy, an orbital motion inside each field. I consider A and B as gravitational fields, their inner motion can be consider gravitational. As you can see on the picture above, when A and B intersect they create in (and by) their mutual intersection four new fields that vary periodically too. I consider these 4 new fields (two in the horizontal plane and two in the vertical one) as the subatomic particles of the central atomic nucleus which represents the mentioned intersection of A and B. The masses (density and volume) of those subatomic particles, their spatial displacements, and their inner kinetic energies, will depend on the phases of variation of A and B. When AT1-M1 and BT2-M1, in the left side of the central axis of symmetry there will be an electron field (e-) which represents the electromagnetic interaction, and a neutron field (N-) which represents the strong interaction; at the right side there will be an antineutrino (V+) which represents the weak interaction. When AT1-M2 and BT2-M2, in the left side of the central symmetry there will be a neutrino (v-) which represent the weak interaction; in the right side there will be a positron (e+) that represents the electromagnetic interaction, and a proton (P+) which represents the strong interaction. So, at the left side AT1-M1 neutron transforms into AT1-M2 neutrino, the strong interaction decays into a weak interaction; AT1-M1 electron becomes BT2-M2 positron moving toward the right side, the electromagnetic interaction is preserved changing its sign from negative to positive, and in the right side BT2-M1 antineutrino transforms into BT2-M2 proton, neutrino weak interaction becomes the strong interaction of the proton. I said electron “becomes” – not transforms into – positron, because electron and positron are the same field moving periodically toward left side at M1 and toward the right at M2 like a pendulum. Strong and weak interactions are forms to call to the forces of pressure or decompression that take place on each subatomic field changing their mass (density and volume) and their inner kinetic energies. In the case of the electromagnetic interaction that forces of pressure take place in a different way, you can see it in the directions of the vectors of force. (With respect to electron, I consider the electron as one of the created concave fields. If we try to mesure the pushing force that it creates with its periodical left to right and right to left displacement, we could mesure this forces in a concrete point or in many points. But the electron field has a mass, its volume and its density, and a inner orbital motion. The Parity symmetry violation occurs at M1 because the neutron field is not the mirror field of the antineutrino and viceversa. At M2, P violation occurs because the neutrino field is not the mirror image of proton. But if we add M1 and M2 we will restore the lost order. We will find that neutron AT1-M1 has its exact mirror symmetric field in the Proton BT2-M2 field. And antineutrino BT2-M1 has its exact mirror symmetric field-particle in the neutrino AT1-M2. With respect to charge violation, when M1 T1 neutron field transforms into neutrino at M2 T1, it increases its volume and decreases its density. But because the g quark changed its direction (its sign) the mass of the neutrino field is not the same than the previous neutron, the neutron received the strong interaction of a and f quarks but it received the additional pressure of g too. 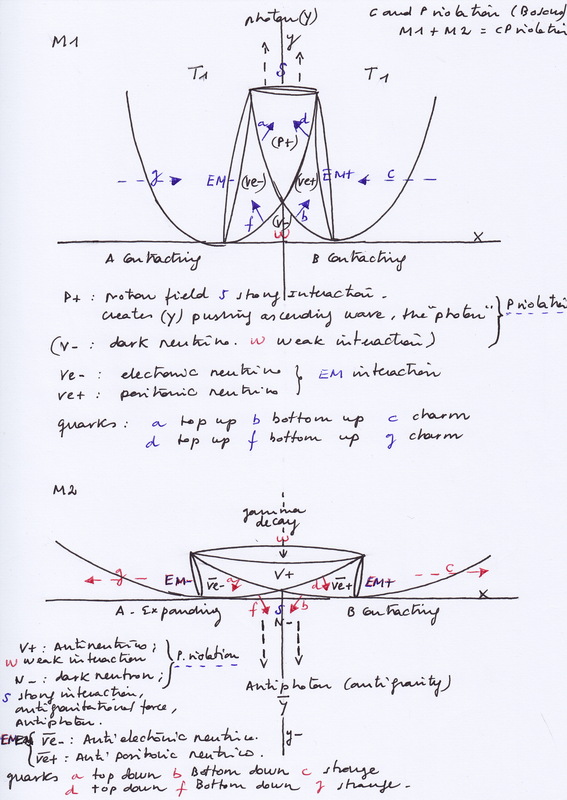 Now the neutrino field experiences the decompression of the quarks a and f because they have changed their sign (their direction) and experiences and extra decompression of g. We cant find the order for restoring that C violation at the right side of the symmetry because at T2 M2 we will have a proton. So for restoring the C symmetry we will need to wait to a new variation of A and B, another momentum 1 when a contracts again and B expands again. It is because the addition of the whole processes that take place at M1 and at M2 when symmetry is salved. When AT-M1 at the left side and BT-M1, at the right side of the central symmetry, there will be two identical but spatially opposite fields with electromagnetic interaction that follows a down to up direction; They respect C and P symmetry. 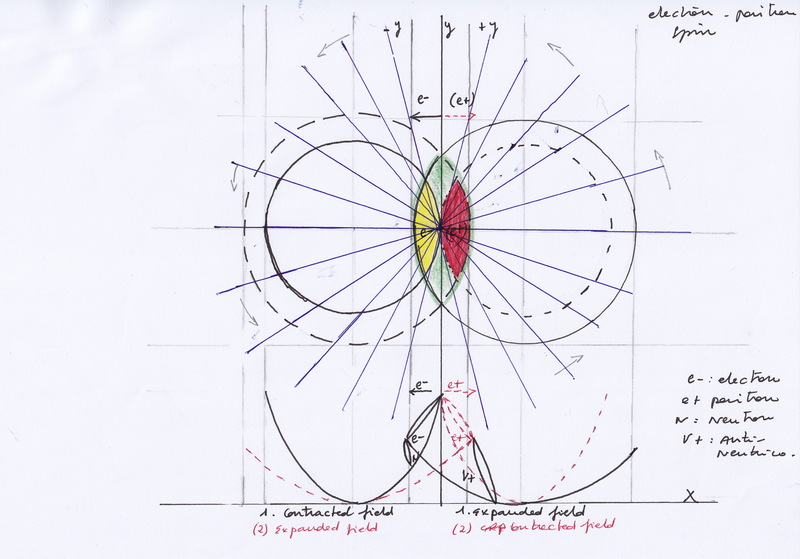 In the middle of the central symmetry there will be a proton field that experiences an ascending displacement that represent a strong interaction; this ascending field will create an ascending pushing force that is identified as a photon. This ascending field with strong interaction as a P and C asymmetry with respect to the inverted field that exist at the convex side of the intersection of A and B fields (I consider this convex field like dark matter, here with a weak violation). When AT-M2 and BT-M2, the ascending energy of central ascending field decays; a “gamma decay” takes place. 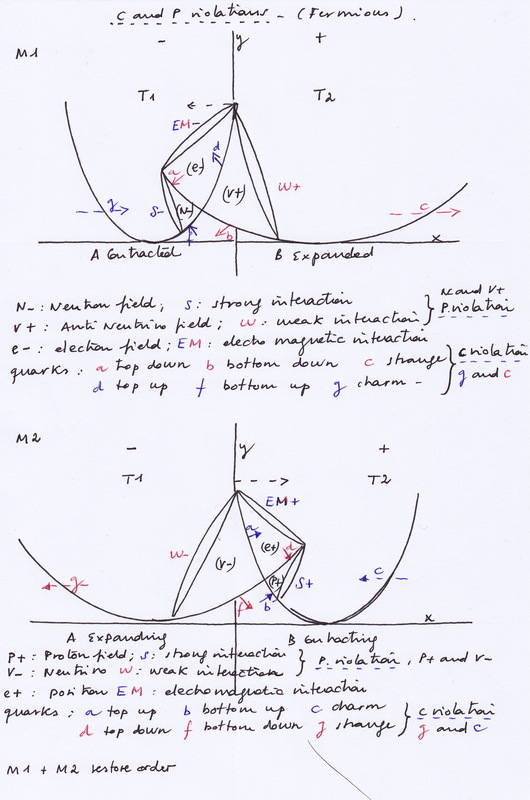 The now descending field experiences a decompression and its strong interaction becomes weak, now it is an antineutrino field moving down; In the left and right sides continue the electromagnetic interactions with an inversion of the signs of their respective charge from positive ascending into negative descending; there are P and C symmetries. At the convex side of the AB intersection there is now a strong dark interaction that, with an antigravitational direction, creates an antiphoton. If we consider the symmetries and asymmetries that take place adding all the processes of TM1 and TM2, then the electromagnetic C and P symmetries result violated, because although all the signs result exactly inverted, the volumes of the simultaneous left and right fields are different at M1 and M2, and their masses are not preserved either, because the pressures that they received at M1 are different than at M2: in M1 they received the extra compression of c and g, and at M2 they experience the decompression of c and g.
Instead, the strong and weak P violations are restored when adding M1 and M2 processes; with respect to their P symmetry The concave and the convex fields do not appear exactly mirror inverted fields. I think that when it comes to mirror matter it is necessary to consider mirror inverted symmetries, like the reflection of an image on a mirror, but mirror reflection symmetries too, like the reflection of an image on a lake. On the other hand, it could be thought that all mentioned fields could move periodically around the central axis of symmetry, so they could experience a kind of spatial displacement or prelation between each AB expansion and contraction. In this case, the consideration of symmetries and asymmetries should be reviewed. CP symmetries would be restore in different times, when all the particles placed at one side of the central symmetry become placed at the opposite one.